I would venture to say that if you are a Tightly Wound Woman then you probably struggle with a performance mentality on some level. Do you try and earn God’s approval by what you do for Him? Do you strive to earn His love and forgiveness by doing good works for others? Do you long to operate in the reality of grace, but often find yourself favoring legalism with your actions? Frustrations arise when others don’t perform how I deem best. I wear myself out striving for excellence. I long to rest on the inside and stop working so hard to measure up. We can get blinded in the spotlight. We may crack under the pressure of constantly trying to manage our image. Can I let you in on a secret that I am desperately trying to grasp? His grace is sufficient. The Law does not save, but reveals our need for a Savior. 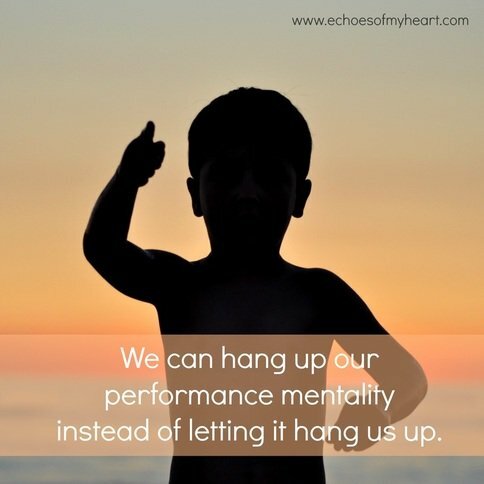 We can hang up our performance mentality instead of letting it hang us up. There is help available for us to follow the direction of the One who shines brighter than we could ever dream.